Review date: 10 May 2001. Cordless mouses are an interesting idea. They don't have a cable to snag on desktop clutter, and some people find that a very attractive idea. For ordinary desktop use, I've got to admit that I don't quite see the point; cables aren't that annoying, are they? But for controlling a computer from a distance they're handy, and they're not too bad if you just want to have a bit of a pose, either. The radio-frequency models of cordless mouse (as opposed to the infra-red ones, like the A4 Tech one I compare with an earlier cordless Logitech model here) also offer considerable flexibility. You can control a computer that can't be seen at all, because the receiver can be under your desk as you use the mouse on the top. The problem with cordless mouses, of course, is that they need a power source. If the mouse is an accessory for a send-and-receive graphics tablet like the Wacom Graphire I review here then it won't need batteries, but cordless mouses that work on ordinary mouse pads do. 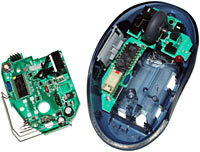 To keep battery consumption down, cordless mouses have, until now, all used an ordinary opto-mechanical mechanism. A rubberised ball drives two slotted wheels between photo-detectors, which can tell which way the wheels are turning and how fast. It's old technology, it's proven, it's cheap, it works quite well. And it doesn't need much power. Opto-mechanical mouses need occasional cleaning, though. And they don't work on uneven surfaces. Modern optical mouses, that have a tiny camera built into their underside that looks at the motion of the surface under the mouse and uses high powered Digital Signal Processing (DSP) hardware to tell which way the mouse is being moved, are better. They work on any surface that isn't see-through or reflective, they never need cleaning, and they're lighter, too. But optical mouses need an illuminator to let the camera see what's going on, and they need to run that DSP chip, too. The super-bright red LED illuminator and the somewhat power hungry processor mean that an optical cordless mouse would appear to need some pretty fat batteries. 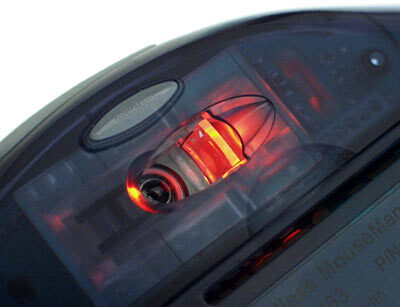 Optical mouses commonly have a current rating of about 100 milliamps (mA) at five volts. They probably don't draw that much when they're stationary and dim their illuminator a bit, but half a watt still isn't a bad guess (watts equals volts times amps). Run a half-watt device from a pair of AA alkaline cells and it'll want more than 150mA, which is more current than AAs want to deliver. This causes a voltage and capacity slump (and the lower voltage means you need even more current for a given wattage...). You may be left with little more than one amp-hour (Ah) effective capacity, and maybe seven hours of battery life. Use 1.5Ah rechargeable cells, which have lower internal resistance and higher current capacity, and you may get a big ten hours of run time. 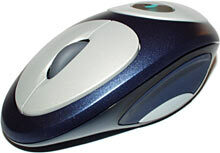 A normal non-cordless opto-mechanical mouse's power rating's likely to be about a quarter of what an optical model wants. Without any power saving tweaks at all, a mouse that draws 25mA from 5V and is refitted to run from the nominal 3V of a pair of alkalines should only want about 40mA for the same power. That's much kinder to AA cells, which means the alkalines will give more capacity, and you'll probably get 60 to 70 hours of battery life. A simple system that makes the mouse go to sleep when its sensor wheels aren't turning can stretch the battery life dramatically. Other power saving tweaks have made cordless opto-mechanical mouses even more miserly. The two I review here both run from a pair of little AAA cells, but should still give around three months of use per set of batteries. Doing the same thing with an optical mouse, though, is more challenging, and so nobody's made one until now. Say hello to the Logitech Cordless MouseMan Optical, the world's first cordless any-surface optical mouse. Yours for $US69.95 plus shipping if you buy it from Logitech's site in the States; $AU165, delivered here in Australia, from Aus PC Market (Aussie buyers can click here to go to the site and place an order, if they just can't wait). The MouseMan Optical has special low-power optical hardware and extra power saving features, which give it an official battery life of "up to 3 months". Well, "up to 3 months" is a term which includes periods of time "down to ten seconds", but it's actually not an unrealistic claim, as we'll see. But first, the important stuff. Looks. There's no one angle that shows you what shape this thing is. It's not actually as weird-looking as that might imply but, from most angles, it does look more like a Vorlon hand grenade than a mouse. Click on this little picture and you'll see a 1600 pixel wide version, which may manage to give you some idea of what shape the gadget actually is. Fortunately, it feels a lot less weird than it looks, and is actually rather more like a plain semi-rectangular mouse than Logitech's pseudo-triangular MouseMan designs of the past. It's a nice feeling piece of hardware, if you don't object to its shape. The button microswitches have a satisfying click, the rubberised wheel doohickey has a pleasing springiness, the single low-placed side thumb button's easy to miss when you don't want to press it and easy to hit when you do. Most of the side thumb area is just a rubber grip. The sculpted shape of the mouse also means that you can, in a pinch, use it with your left hand. It's not ideal, and it's certainly not a product a lefty's likely to want to pay for, but if you're left handed and find yourself stuck with one of these, you'll hate it less than you will other asymmetric mouses. Here's the hardware in the Cordless MouseMan Optical kit. You get a CD and minimal paper documentation as well; the main manual's on the CD. Like Microsoft's optical mouses, this one's a dual-mode PS/2 and USB gadget, with an adapter that turns the USB plug into a PS/2 mini-DIN connector. This adapter won't let you use other USB mouses for PS/2, unless they can speak both languages already; the two interfaces are quite different electrically as well as physically, and a mere plug adapter isn't enough to do the trick by itself. Like the older dual mode PS/2 and serial mouses, the current ones have the built-in ability to connect to both kinds of interface. The receiver module has about four feet of cable, and you can put it pretty much wherever you want. The one button on the receiver activates a resynchronisation procedure; there's a tiny press-it-with-a-pen button on the bottom of the mouse that does the same thing. You'll probably only need to press either of these buttons if you've got other Logitech radio-frequency cordless gear nearby; they let the gadgets change their radio channel so one won't interfere with another. If the Cordless MouseMan Optical uses the same radio system as their last few cordless mouses and trackballs, it'll be a 27MHz device with four available frequencies. So one desktop user shouldn't have any trouble using it with a Logitech cordless keyboard as well, as long as there's not a load of 27MHz interference nearby (if the neighbour's kid's radio controlled car zots your MouseMan signal, tough). The relatively short range of the system ought to make it workable even for multiple users in an office. 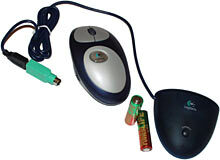 Getting an optical mouse to run from batteries without needing a belt of them feeding it like a machine gun is tricky. 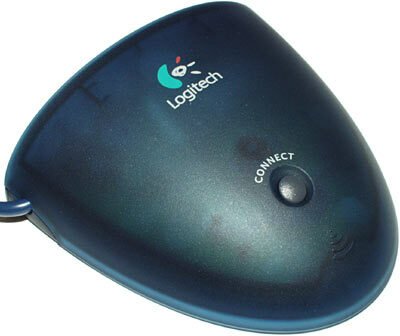 Logitech have managed it, partly by using power-saving technology, and partly by using bigger batteries. Most cordless mouses run from AAA cells. Quality AAA alkalines have a low-drain capacity of something like 1150 milliamp-hours (mAh) - that's what Energizer quote for their premium "E2" AAAs. That's from a 25mA drain. The current model "super" alkalines like the E2s and Duracell's "Ultra" range have better current capacity than older alkalines. Old-model AAA alkalines are in high-drain land when you ask for much more than 10mA, and lose capacity. AA cells, though, hold a lot more juice than AAAs. The E2 AAs have 2850mAh capacity from a 25mA draw, and you get the same sort of capacity ratio from non-premium alkalines, too. It's hard to find an alkaline AA that doesn't have more than twice the capacity of any AAA cell. So AAs are a much more attractive prospect if you're trying for maximum battery life in some gizmo you're designing. Hence, the Cordless MouseMan Optical runs from a pair of AAs. To get the batteries in there without turning the mouse into a hunchbacked monster, Logitech have come up with this interesting offset design. With the mouse on a desk in the normal alignment, the battery bay's on the right hand side of the bottom. The bigger-than-usual cells take up more than half of the mouse's width, though, so the actual optical pickup's offset to the left side of the mouse base. If you're holding the mouse with your right hand, the pickup lies directly under the middle of the proximal phalange of your index finger. The mouse has four power modes - full-on, and three pulsed modes, in the lowest powered of which the whole system draws close to no current. From three volts, waggling the mouse around and clicking buttons like crazy draws something like 40mA. More normal use draws about 30mA. In this full-on mode the LED's flashing 1500 times per second, which is the same rate used by other optical mouses. It looks as if it's constantly on. Very shortly after you stop moving and clicking, though, the mouse drops into a lower power mode, in which the LED flashes only 100 times a second, making it look a lot dimmer. Now it only draws about 6.5mA, but it can pulse back up to the full power mode any time it thinks something's happening. Leave the mouse alone and you it dims further and slows its pulses more, going through a 10-flash-per-second mode and ending up on a two-flash-per-second mode that has only about a 0.3mA average draw. Once again, though, moving the mouse or clicking a button gives you full power mode again. There's a maximum of a half-second delay before the mouse notices you've moved it, even in the minimum power mode. How much run time you'll actually get from a set of batteries depends, of course, on how you use the mouse. If you never stop moving it and clicking it, all day every day, then a set of unremarkable 2500mAh alkalines will last you about 80 hours. Now, no human's likely to behave this way (well, not unless they're at a long-weekend LAN party with a whole lot of caffeine on hand, anyway). With normal use, and considering the very miserly low power modes, Logitech's quoted three month battery life doesn't sound completely unreasonable. That works out at little more than a 1mA average draw for 2.5Ah cells, though; if you're using the computer with the Cordless MouseMan Optical as a nine-to-five work machine, I think one to two months on a set of AA alkalines would be more plausible. You can also use rechargeable cells, if you like. The LED illuminator seems to have a pretty wide range of intensities beyond the four flash rates mentioned in the Logitech literature. If you turn the mouse upside down, for instance, and move your hand to cast a shadow over it, the illuminator will smoothly brighten up as the amount of light hitting the lens falls. This seems to be a feedback-loop setup designed to keep the surface under the mouse illuminated brightly enough for the little camera to work, without wasting battery power on more light than is needed. This could mean that, on average, this mouse will get slightly better battery life if you use it on a light-coloured surface than if you use it on a dark one. Thanks to its combination USB and PS/2 interface, the Cordless MouseMan Optical will work with pretty much any somewhat recent PC, regardless of operating system, and with any USB-capable Mac. If you want to install the accompanying MouseWare software, though, you'll need Windows 3.x, 95, 98, 2000 or ME, or Mac OS 8.6 or later. 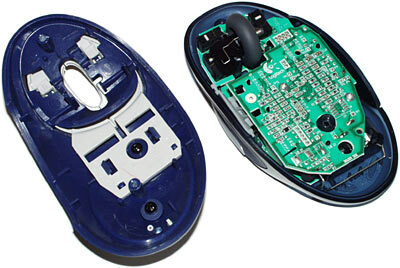 Installing the Cordless MouseMan Optical when I still had my IntelliMouse Explorer plugged in - but without Microsoft's IntelliPoint support software installed - caused the Logitech MouseWare package to misbehave. The Logitech control panel wouldn't come up, leaving me with the standard Windows one. The speed control gave me a choice of a variety of too-slow speeds, and a larger variety of much-too-fast ones. Unplugging the Explorer (USB lets you run as many mouses at once as you like, but that's not necessarily a good idea...) and reinstalling MouseWare solved that problem, though wheel-scrolling in Internet Explorer remained strangely slow. Every other app I tried behaved normally. The MouseWare package lets you configure all of the usual pointer control features - absolute speed, acceleration (how much faster the mouse speed gets when you move the mouse quickly), double-click delay, and so on. You can assign different functions to different buttons, and also change the mouse alignment to compensate for a not-quite-square grip. I found myself doing just that, because the offset sensor on the MouseMan meant I tended to end up moving the cursor a bit diagonally when I wanted to move it horizontally. With the alignment tweak, it was fine. MouseWare also lets you check on the mouse's battery state, and warns you when the batteries are going flat. Logitech's "innovative WebWheel feature" brings to approximately six grillion the number of Weird Things That Can Happen When You Press One Of The Extra Buttons On Your Fancy New Mouse. WebWheel gives you Web navigation functions easily accessible via pointer or wheel-doohickey, which could be very handy if you're taking advantage of the mouse's cordlessness and not sitting in front of your keyboard. It also gives you links to Web pages. By default, you get your Search page, a few other Logitech-selected Web pages, and Logitech's Webmail site. Fortunately, you can set these Web links to whatever you want, making WebWheel into a genuinely useful quick-links thing, if you care to use it. If you don't, you can unbind it from whichever mouse button it's haunting and use that button for something else. Logitech quote a two metre range for the Cordless MouseMan Optical, which seems pretty much right. Interference sources (like computers...) are more likely to affect the range than is desk clutter. The Cordless MouseMan Optical's sensor might be a little fussier than the one on my Microsoft mouse, but I'm not sure. It seemed to track slightly less well when I moved the mouse quickly. If there's really a difference at all, though, it's small enough that I doubt it'll matter. Particularly seeing as hard-core gamers, who get hot and bothered about small tracking errors that cause their laser rifle beam to pierce an enemy's ear rather than his temple, aren't going to want this mouse anyway. You see, Logitech are rather proud of the fact that the Cordless MouseMan Optical has an 800 dot per inch resolution sensor, versus the 400 dots per inch that other opticals offer. This is a valid boast; more positioning accuracy is a nice thing to have. Even if you're running a 1600 by 1200 screen resolution, an 800dpi mouse can cover the whole screen in single-pixel steps using only two by 1.5 inches of mousemat, if you set the mouse speed appropriately. A 400dpi mouse set to give the same amount of cursor movement per inch of mouse movement will be moving the pointer in two-pixel jumps. This sort of thing matters for desktop publishing and graphics people, and for action game fans as well - at least for the abovementioned snipers, it does. The Cordless MouseMan Optical has one feature, though, that kills it as far as the mouse-enthusiast nutty-gamer market goes. Sample rate. The standard USB mouse sampling rate for Windows is 125Hz; that means the location of the pointer's update 125 times a second. 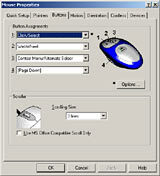 You can boost PS/2 mouses to work at considerably higher rates than that, with tweak utilities. If you draw a fast curve in a paint program, any mouse with a higher-than-100Hz sample rate will give you a pretty round curve. Slow sample rates will give you a noticeable connect-the-dots effect. A crummy old PC serial mouse has only a 33Hz sample rate, which is noticeably lousy. But every cordless mouse I've used, USB or PS/2, has had only about a 50Hz sample rate according to the handy Mouse Rate utility. Which is better, but not as good as corded mouses can manage. And this is the case with the Cordless MouseMan Optical, too. It may have excellent resolution, but Mouse Rate gives it alternating 62 and 41Hz sample rate scores in USB mode, for a 51.5Hz average. In PS/2 mode, it's 50Hz scores all the way, with the odd 49 or 51 thrown in for spice. That's all the cordless hardware can handle; no utility can tweak the sample rate up any further. Logitech's FAQ for the Cordless MouseMan Optical says that the mouse will "provide you with responsiveness that is better than the currently available corded optical mice"; well, no it won't, if you want a high sample rate. Resolution good, software fine, sample rate lousy. Apart from the sample rate, this is a nice mouse to use. It's ergonomically pleasant (provided you're right handed), and it doesn't feel heavy, either. 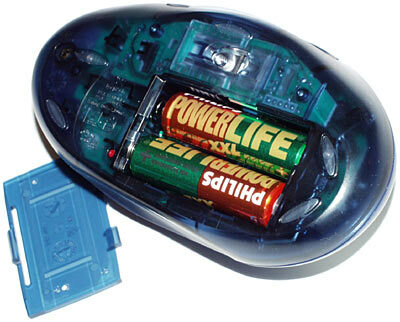 The two AA batteries make the Cordless MouseMan Optical noticeably heavier than other optical mouses, but it's around the same weight as various ball mouses. Unscrew the lid of the Cordless MouseMan Optical and it is, as you'd expect, pretty tightly packed. Everything's pushed around by the big battery bay. You can see the giblets properly with the top circuit board - which holds two of the battery contacts, and the raised antenna wire - removed. It's all pretty standard looking optical wheelie-mouse components. They're just in unusual places. I don't recommend that anybody buy a mouse for daily use without trying it out first. You're pretty safe with plain, cheap, symmetrical designs; nobody's likely to find them to be an amazing ergonomic revelation, but pretty much anyone can use them without being too annoyed. Fancy sculpted mouses, though, are a matter of taste; they always feel weird for the first few hours of use, but some people find that some mouses keep feeling weird forever. Which is probably something you'd rather not spend $AU165 to discover. You can only do so much testing in a shop, but it's better than nothing, and nothing is the amount of testing you get when you mail-order a mouse. Then again, the Cordless MouseMan Optical strikes me as a better sight-unseen bet than most sculpted mouses as far as user comfort goes, but that might just be me. It isn't huge or tiny, so it ought to match any right handed user pretty well. And it's not a really avant-garde design, like some mouses I could mention. But it is a funny shape, and you may just not care for it. Assuming you don't mind the shape, this looks like a fine product for most users. There's a decent selection of buttons, there's OK support software, there's USB and PS/2 compatibility. And there is, of course, no cord. It's expensive, but it's quality. If you're a hard-core action gamer for whom too much refresh rate is barely enough, no cordless mouse will suit you. 50Hz is fine for general mousing around, though. And if you want a cordless mouse that doesn't need cleaning, this one's the only current option - and will be a better option than any more cheaply engineered corded-mouses hacked into cordless ones without enough attention paid to reducing the power consumption. If you can stand the price tag and you like the shape, the Cordless MouseMan Optical's a great general purpose input device. Readers from Australia or New Zealand can buy Logitech mice, mouses or meese from Aus PC Market.